This post and the next few will have several hands on math activities you can do with your kids (toddler to kindergarten age) Althought mostly preschool math will ve covered, with a few changes, you can use many of these activities for school age children as well. 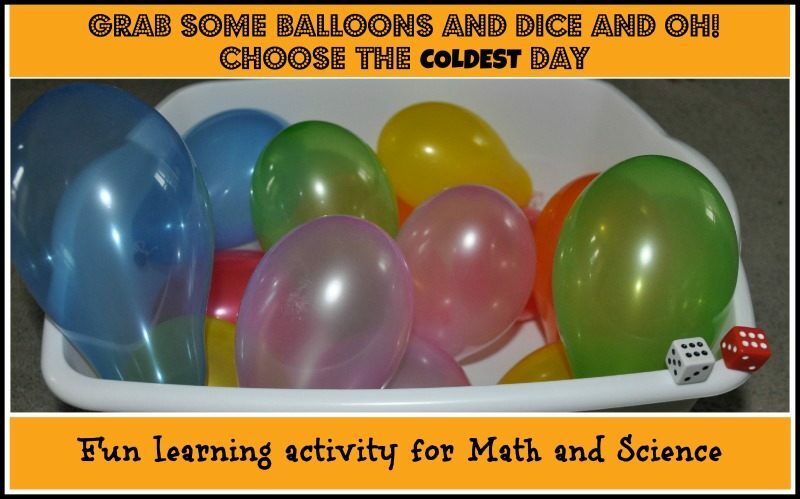 Please read the introductory post here for this ABC series of Math Activities. Gotcha! You thought I’ll say “A is for addition”. 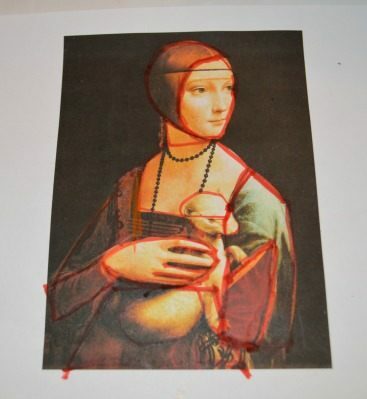 Yes addition is great but if you spot math in fine art, you would be drawn in too. We have many addition activities covered through the series. I remember as a kid when I asked “Why should I learn math?” the one answer I ALWAYS received was ” Math is everywhere”. Here we came up with a really fun way to explore art and math together. Look! Look! Look! is an excellent art-appreciation book for budding artists and art enthusiasts. 3 mice observe and analyze a post card painting of an art piece recognizing , colors, shapes, patterns and lines. Eventually they make their own art using their patterns. Drawing inspiration from the book, we observed a renaissance art work by Leonardo Da Vinci and identified shapes, patterns and lines. Go and check out the book: great for fine art enthusiasts. We chose Lady with an ermine image and started identifying patters and shapes. Big A and I outlined the shapes we could spot on the image and cut out those shapes from colored sheets. 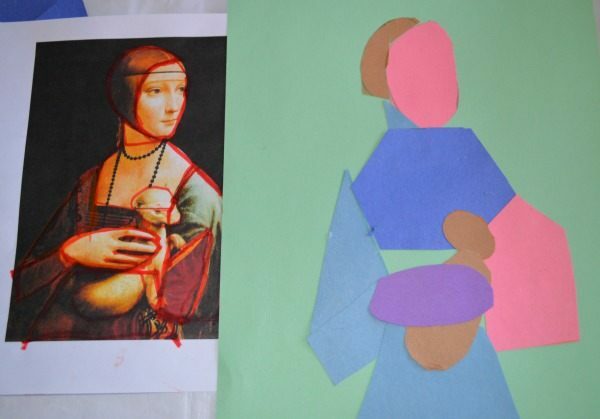 After we cut out the same outlined shapes from the art work, we used the picture as a reference and pieced the cut-outs together to form our picture. This math activity is very similar to having the child point out different shapes in a room. With a piece of art, there is focus and made it fun and exciting for my pre schooler to spot shapes. It took a form of its own and turned into a game. At a young age, picture books are a great way to introduce mathematical concepts to the kids. The kids were introduced to addition, counting, geometry etc only through picture books. I have personally seen that kids learn better and faster when you are simply having a casual conversation about the concept. My preschooler is very verbal and this kind of “talk about it while reading a book” approach has worked very well with her while introducing new concepts. Below I have a list of books which explores many mathematical concepts. Counting is one of the first exposure to math for kids. 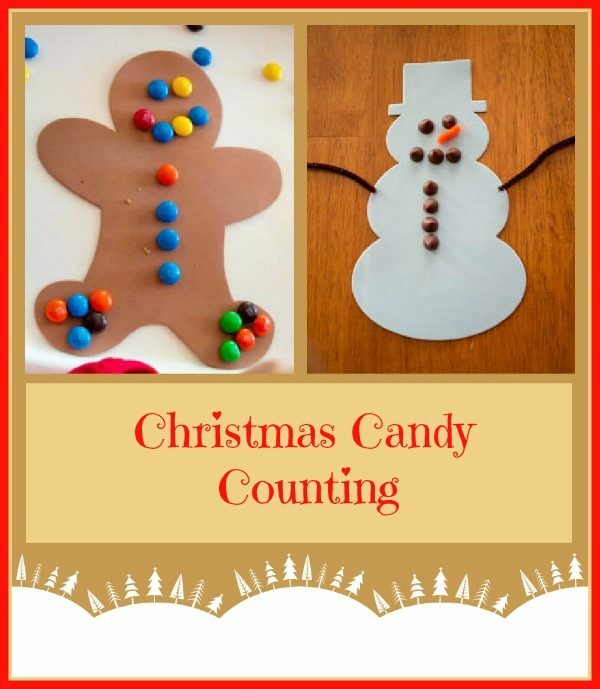 There are numerous hands on ways to make counting with kids interesting for them. We have done a few math counting activities in the past. We used balloons and “static” to practice counting. 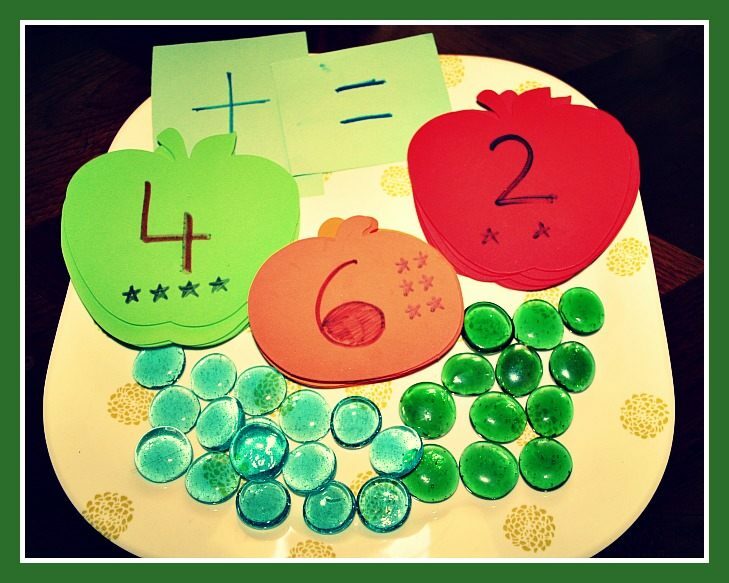 We used glass gems and apples to practice some one-to-one correspondence and extended to practice addition. 1 . Good Long road used coins and glass jars to teach counting and cleverly extending the activity to teach her son about money. 2. 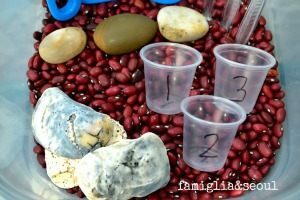 Connecting Family and Seoul used beans, cups and a good book to create a sensory bin for practicing counting. 3. 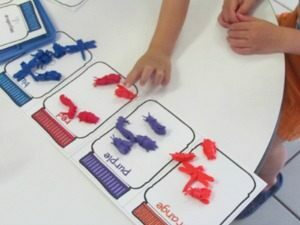 Teach Preschool used adorable bug cards printable and fun creepy crawlies to entice kids to have fun with counting. 4. This ingenious idea from In Lieu of preschool is a must-do for all kids. 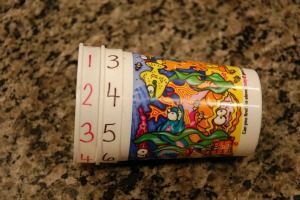 Use cups to explore numbers and couple of more ideas. 5. 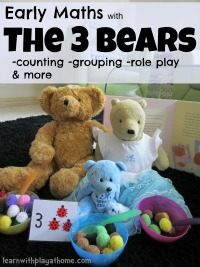 Learn with play at home used bears, pom poms and home-made number cards to explore numbers and much more. 6. Hands on as we grow used dice and blocks to understand one-to-one correspondence and made counting fun for her son. 7. This uber-clever and cute idea comes from Mama Pea Pod. 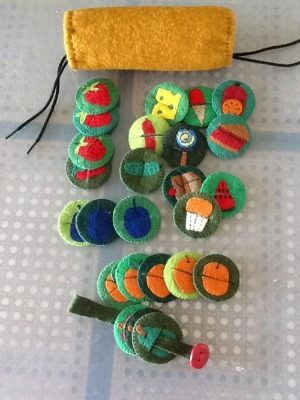 She used felt food to go with The Hungry Caterpillar Book to make counting interesting. 8. 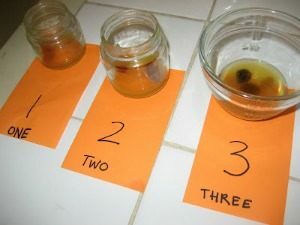 Love Play and learn turned counting into a super sweet exercise with this activity. For some quick hands on math games, dominoes never fail us. 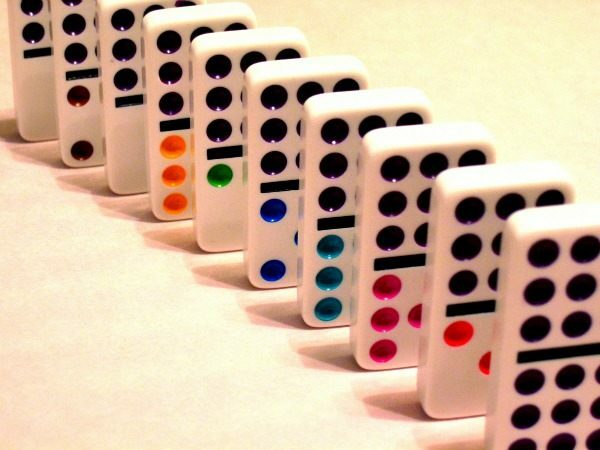 With an in-build counting activity, it is very simple to expand, extend and turn a game of dominoes into a hands on math activity for the kids. Simply use them for counting the number of dots : Great for toddlers. 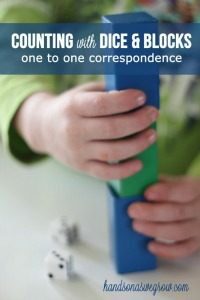 Once counting is done, use a number card and create a one-to-one correspondence activity. By using this printable,kids can match the figure on the worksheet with a domino and place them on top and continue the math operation. Also, matching similar looking tiles while counting the dots is also good practice. Identifying the dot patterns and guessing the number of dots without counting ( for older kids) Younger ones would benefit from counting practice. Egg cartons are so versatile. 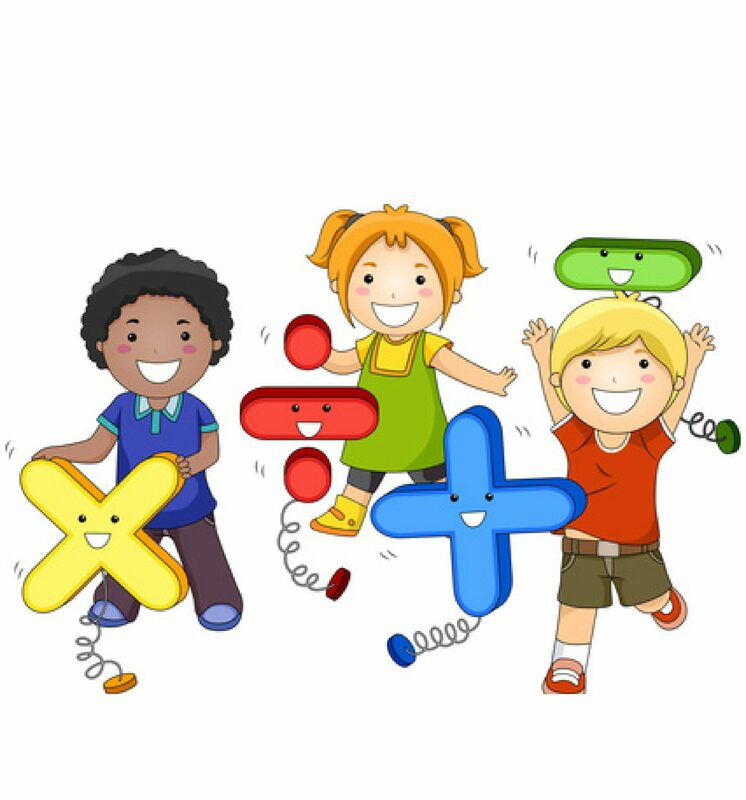 They lend themselves for art projects, crafts, experiments, fine motor play and even for math activities. You just get creative with the cartons and can make up your game or activity to create a math game for your kids. We used egg cartons to create a memory and addition game. Check out letter G for that one. In the mean time if you need inspiration check out these amazing egg carton math ideas from around the internet. Use egg cartons to measure, make patterns, explore counting and spotting missing numbers. Race to the finish element really kicks this one up a notch. Don’t miss this post where legos and egg cartons are used to learn many numerical concepts. 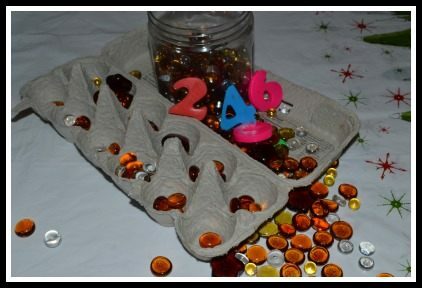 Cut up the egg carton and make a number toss game. Great for number recognition, addition and more. This post is a part of a ABC series brought to you by 70+ bloggers and hosted at “This Reading Mama“. Check out her blog and thanks for the amazing work she has put into organizing this event. Kudos to her! The art activity sounds awesome! What a unique idea. I love it. all these activities are great but they seem geared toward smaller children. do you have any more fun activities for school-age children. Great list! Especially the books…my kiddo would love those. I love all the hands on math! Great list and looking forward to more ideas, this is very helpful. Wow! 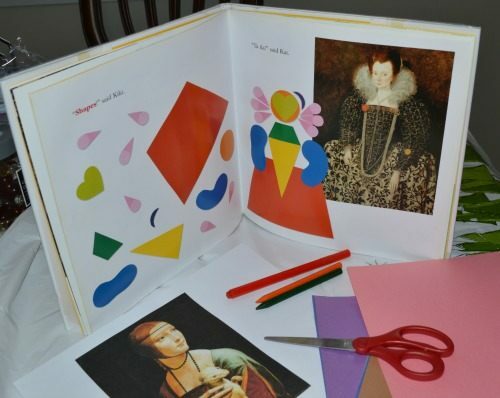 I love your art activity, I will be trying that with my girls. Can’t wait to see tomorrow’s list. Thanks.. The Look!Look!Look! was one great library find in the recent past! I love the layout of this post. What great ideas!